A sunny day with temperatures in the mid twenties made for a perfect autumn day to get out on the bike for a ride, and as Christian was unable to lead the ride I volunteered to take over. Michael and I rode from Marysville to Café Metsa in North Melbourne to meet with the group at the first pick up point. After a quick coffee nine bikes departed to the second pick up point at the Tullamarine Aircraft Viewing Area in Bulla, where we met with Darren B who was unveiling his recently purchased 2006 Kawasaki ZX-10. 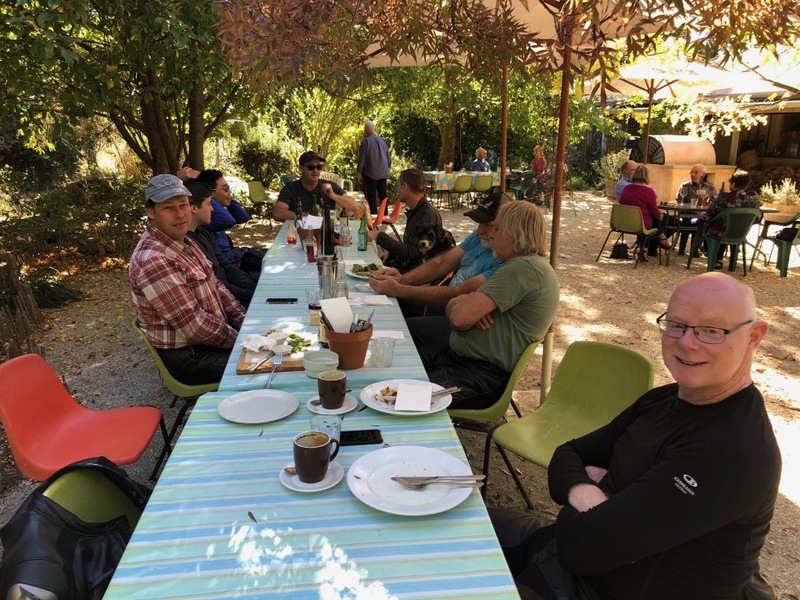 With ten bikes and one pillion the group headed directly north towards Oaklands and Clarkefield before our first fuel stop at Romsey, where road works along the Melbourne Lancefield Road ensured the riders were kept in a close huddle. From Romsey we continued north to Lancefield and then turned off towards Pyalong. The sunlight filtered through the canopy of trees above as we traversed the winding road to Pyalong. The only distraction from this perfect tranquilness of our surroundings was the distant roar from the freight train of motorcycles fast approaching from behind. Once we arrived at Pyalong the ride continued along this very scenic route to Seymour. At Seymour we stopped out the front of the local Police Station for a regroup and an opportunity for me to check the map. Not wanting to tempt fate with the local constabulary, I decided that we’d loitered enough and forged on through the township of Seymour and on to Highlands. Our lunch destination at Ruffy was still 50 minutes away, so we had close to another hour of these fabulous roads. The Highlands road between Seymour and Caveat is quite spectacular on a motorcycle. We pulled up at the Ruffy Produce Store in all its beautiful autumn colors. Ken & Evan were waiting out the front to greet us and join the group for lunch. A long table was reserved under the autumn trees in the garden and you couldn’t have wished for a more picturesque lunch setting. A couple of meals were a bit slow coming out of the kitchen, so we had plenty of time to take in the scenery. Once everyone was fed and watered we continued partially on the road we came in on, but then turned off towards Gin Ghin and Yea. There was another fuel stop at Yea before heading to wards Melbourne via Flowerdale and Kinglake West. 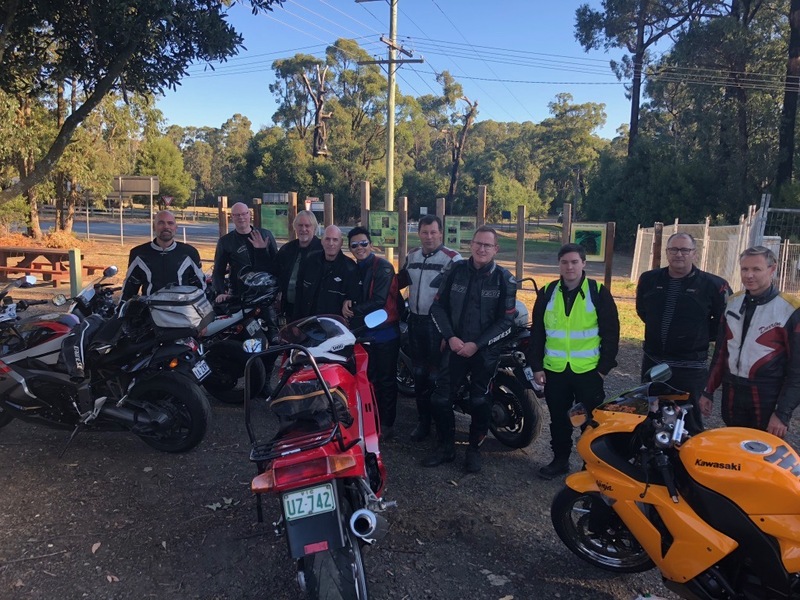 We arrived at Kinglake West around 4pm where I ended the ride and after our goodbyes the group headed off in all directions. This was a really awesome and most enjoyable ride. Thanks to Christian for organising and planning the route. Too bad you didn’t get to execute your plans, and special thanks to Phil from Geelong for volunteering to be tail rider for the day, a job well done. See you at the next monthly meeting.